This WMS slot machine is themed around a very well known movie with the same name, which was released in 1971. It was a musical with a fantasy story behind it, about a kid that wins a ticket to a chocolate factory belonging to Willy Wonka. The game is built under official license, so naturally you will find among its symbols some with images of the actors that played in it. This slot has a unique offer, which is mostly related to the features, with nine different types of bonuses to give you, with free spins, wilds that expand and scatters. There are 40 paylines inside and the best prizes go up to $7,500. The slot’s features will give you the usual wilds, but they are capable of expanding on the reels here. You also get free spins and scatter symbols. Add a Golden Ticket feature which can bring you a prize, just like in the movie. The wild symbols expand to take over the entire reel they appear on, and you will know that you got them when you see the Oompa Loompa characters show up. The ability to expand makes them highly valuable features to take advantage of. To get free spins in this slot, you need the right symbols to appear in multiple spots at the same time. The free games have oversized symbols which make appearances on two to five reels each round, being stacked and potentially offering lots of prizes at the same time. In total, there are about nine different types of bonus features which can get started if you’re lucky. One is the Gobstopper Picker, where you have to make a simple choice and win up to 5,000 credits. Another is called Chocolate River Ride. A Golden Ticket can also be found, and inside are prizes of up to 5,000 coins. The minimum line bet is $0.01, the maximum is at $5. Given the number of paylines that we’re dealing with, you can use up to $200 wagers each round. The rewards are decent enough, offering 1,500 coins, or up to $7,500. A progressive jackpot is also mentioned. The inspiration for the game comes from the 1971 musical with the same title, so you can expect the same characters to make appearances, with real photos of the actors being among the icons which will land on the reels. The 70s design is there, and for the fans of the film it will be a pleasure to see it. The topic is one that many will recognize, and I’m sure players will want to try it out and see how it works. It does well feature wise as well, but I personally am not a fan of the 70s inspired graphics. The movie which inspired the slot was released in 1971. An American Musical, it had Gene Wilder in the main role, that of Willy Wonka, while the director’s name was Mel Stuart. The movie is actually an adaptation based on the novel by Roald Dahl called Charlie and the Chocolate Factory. Just like the novel, it tells how Charlie Bucket won a Golden Ticket, which allowed him to visit a chocolate factory owned by Willy Wonka. 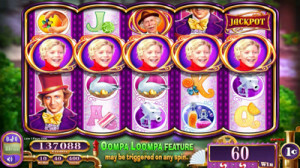 You will find Willy Wonka and the Chocolate Factory at any online casino which chooses to use software from WMS, playable either for free or for real money.